Browse to the old drive and choose the iTunes “library.itl” file. This will load up the iTunes library from the old hard drive. Now we need to move the iTunes library to the new hard drive. Select Preferences => Advanced. You should be viewing the following screen. 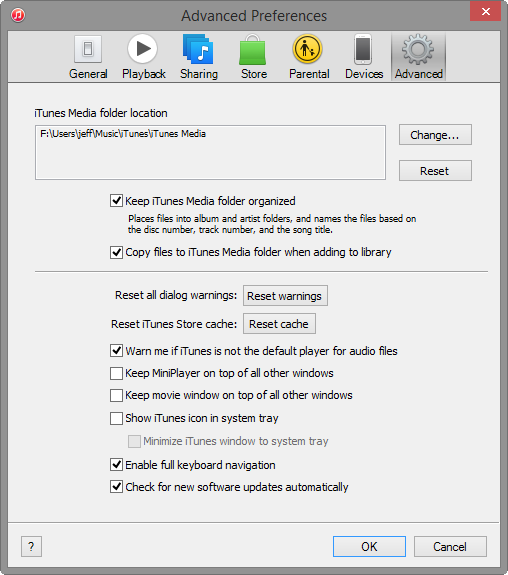 Select the Change button in the “iTunes Media folder location” pane. The Change iTunes Media Folder Location window appears. Choose where you want to save your new iTunes Media folder. Note: Your iTunes Media folder is named “iTunes Media” in ~/Music/iTunes/ (the tilde ~ represents your home directory). Click OK in the Advanced window. The following prompt will come up. Select “OK”. Now we need to consolidate the libraries. You can go to the drop down menu in the upper left corner and select “Show Menu Bar” option. All of your media files should copy to the new location. This will take some time depending on the size of your media files. After the folder copies. Quit iTunes. Find your original iTunes Media folder and rename it to old_iTunes. 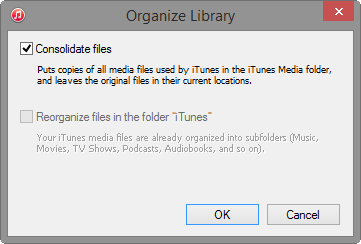 If you see the alert “The folder containing “iTunes Library” cannot be found, and is required. Please choose or create a new iTunes library.” you will need to manually move the “library.itl” to the new iTunes Library location. Copy the file to the new iTunes folder. When the alert “The folder containing “iTunes Library” cannot be found, and is required. Please choose or create a new iTunes library.” comes up, select “Choose Library”. Select the “library.itl” file in the new location. If you can open and close iTunes without seeing the alert, you can now safely delete the old iTunes Library. This will provide a general guideline I used to recover iTunes library after replacing my hard drive.